UNITED NATIONS, New York — When a 26-year-old street vendor in Tunisia set fire to himself in an act of desperation, he also ignited a flame of protest that rocked the entire Arab region. Youth’s involvement in the ‘Arab spring’ has been unprecedented. Using social media platforms such as Facebook and Twitter, protests by young people against human rights violations, unemployment and the status quo spread throughout the region. From Tunisia to Egypt, their voices were heard around the world. “Youth in Arab states have had an incredible sense of responsibility, and have therefore renewed the idea of the universality of human rights,” says Mona Kaidbey, Deputy Director of UNFPA’s Technical Division. Ms. Kaidbey made those comments at a panel titled ‘Youth in the Arab States: Reshaping History’, which took place this week as part of side events of the United Nations High Level Meeting on Youth. UNFPA was joined by academics, government officials and youth leaders of the region to discuss how youth have become powerful agents of change in the region. Young people in the Arab States constitute about one third of the region’s population. Yet youth are often excluded from decision-making processes due to lack of education, high unemployment and poverty. For example, youth unemployment rates in the region averages between 20 to 25 per cent, and it takes many of them years to get their first job. Young women have an especially difficult time finding work. As youth took the streets and political regimes in Tunisia and Egypt collapsed, many governments and organizations had to rethink their engagement with youth. As events in Arab States unfolded, UNFPA renewed its commitment to youth in the region. Since taking office this year, UNFPA’s Executive Director has been very vocal about their key role in development in the Arab States and elsewhere. Y-PEER, a UNFPA-supported peer education network that has been active in the region for several years, became an even more important way to connect and raise awareness about reproductive health challenges, especially in times of crisis. Thanks to its network of youth educators in Libya, UNFPA was able to conduct a virtual assessment at the height of the conflict to understand youth’s evolving needs and aspirations. Youth leaders gathered answers through questionnaires given to small groups of young people. Many young people in the network insist that they shouldn’t be seen as victims of their societies’ problems. “We shouldn’t work with youth because they are marginalized, but because they are real actors in our society,” explained Ahmed Awadalla, a member of Y-PEER in Egypt. UNFPA also assisted Morocco’s Ministry of Youth convene a youth forum in May 2011 that drew over a thousand young people. Many engaged in a public debate alongside 20 ministers of the government. This unique platform for dialogue allowed youth to be included in the country’s democratic process. “The debate on the street became official,” explained Mr. Younous El Jaouhari, Director of Youth, Childhood and Women Affairs. “We made big changes on paper in our constitution, but we need to support young people to be agents of change.” The forum led to new ministerial conventions regarding employment, medical insurance and the establishment of youth friendly health centres. As young people became catalysts for change in the region, many also faced dangerous situations and were forced to flee their countries. Life in crisis zones can be particularly hard on young people. Youth in refugee camps near the Tunisian-Libyan border saw some of their aspirations crumble (see Mawahib’s story below). UNFPA has recently trained 22 educators, between the ages of 15 and 24 years to work with displaced populations along the Libyan border and bring up sexual and reproductive health issues and other sensitive subjects with their peers. Manel Stambouli, of UNFPA Tunisia, insists on the importance on creating opportunities for young people in camps, and providing them a safe space where they can voice their preoccupations. “If there are no alternatives for them, many young men in refugee camps are tempted to return to Libya and join the fighting,” she said. Nor can the world afford to lose out on their dynamism. As UNFPA’s 2010 State of World Population Report argued, youth can play a key role in post-conflict recovery and peacebuilding processes. They are the ones, after all, who have the greatest stake in the future. Mawahib is a 20 year old refugee who lives in Choucha camp in Tunisia, at the border with Libya. 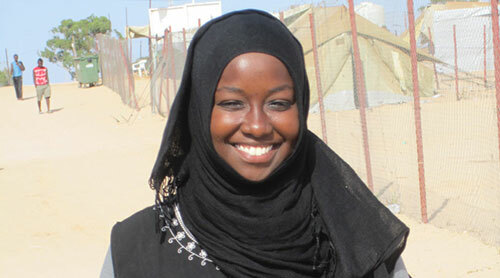 Mawahib volunteers with MSF and was recently trained by UNFPA to educate her peers about reproductive health issues. 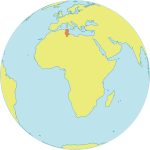 CHOUCHA, Tunisia --- My family is originally from Sudan, but I was born and grew up in Libya. I have lived there all my life and was studying medicine until I was forced to flee because of war. I've never visited Sudan because of the political situation there. My family is from the Darfur region in Western Sudan, an area that is also heavily suffering from conflict. I am proud to be Darfuri and Sudanese, even though I only know my country through the eyes of my family. I hope to return to Sudan one day and heal its wounds with fabrics woven from threads of hope and aspirations. I grew up in a wealthy part of Libya, in the capital Tripoli. I studied at some of the best elementary schools, high schools and universities. I was always first in my class and even got ahead of my peers despite my young age. Pursuing medicine has always been my dream. It is my way to help others as much as possible because health is an integral part of our lives. I hope to become the best neurosurgeon in the world—this will be my contribution to future generations. But everything that is sweet comes to an end eventually. For me, the war in Libya was the beginning of a new chapter in my life, and it seems that I am still struggling to carve my escape from it. Sometimes I feel that I am in a long, long nightmare. I hope to wake up from it. When the war in Libya started, we heard of hundreds of stories of people who were killed in their own homes, or lost all their possessions through merciless looting. We heard about girls who were raped and young children who were used as human shields on the front lines of battle. There are hundreds of horrific and tragic stories which send chills down my spine. It seemed dangerous for us to stay in Libya. We decided to sacrifice our home to protect our lives. Our only option was to flee. We chose to be refugees rather than lie dead in a grave, and that was the hardest decision we made as a family. We left, leaving the home we knew for most of our lives, leaving behind our friends and our studies and our dreams. We left leaving behind a part of our soul. I am now a refugee, a small word that carries an ocean of pain and humiliation; a displacement, a vacuum, psychological distress, the loss of a future… there aren’t enough words to describe our current status. The desert is very hot during the day and very cold at night. Our house is comprised of a small tent where my whole family of six people resides. There is no room for privacy. My brothers and I accept that and try to pretend that we are not bothered by the situation, and I know that my parents are doing the same thing. And you would think this was enough, but yet another disaster poured in. Another tragedy and another psychological trauma took place, taking us back to the same state of terror that we experienced and left behind in Libya. [The camp was attacked in May by members of the nearby community who were angered by the presence of the refugees in the area]. This time it was the biggest shock of my life. I did not expect that I will face this violence while residing in a camp that is set up to protect me. It will remain ingrained in my memory, the time the earth shook under my feet. I confess that I did not completely heal from this experience, but I always try to remind myself that my family and I are fine, and that this is what matters. I am fine and I will be able to fulfill my dream in life. I will continue despite the wrath of humiliation. I am Mawahib and I will not give up. I am the future of my talents. I will be there. What does not kill you makes you stronger.